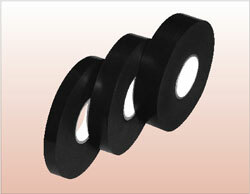 Dry Vinyl Tape is a 3.94mil non-adhesive plasticized PVC film. It has easy unwinding characteristics – tape clings firmly to it’s own backing for tight wrap. High elongation and good strength to permit trouble free binding of wire harness for the automotive industry. © Copyright Deviser Inc. 2005 All Right Reserved.